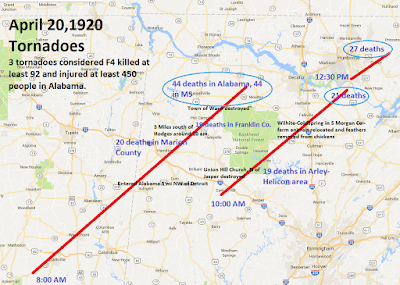 Three tornadoes, all considered to be consistent with F4 intensity, struck northwestern and north-central portions of Alabama on Tuesday morning and early afternoon April 20, 1920, killing 92 and injuring approximately 450 people. These were long track tornadoes that may have reached F5 intensity at some point, but we will never know that with certainty. These numbers are inexact due to conflicting reports and limited information. 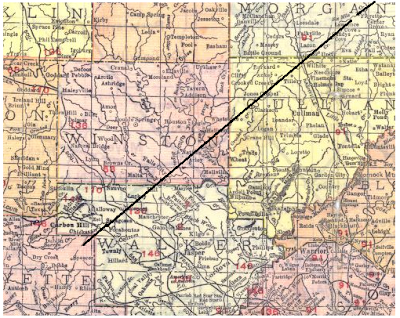 Because of limitations in resources and technology in 1920, the exact number, path length and width, and intensities of the tornadoes is uncertain. It is quite possible that there were more tornadoes that day which may have been of lesser intensity over rural areas. 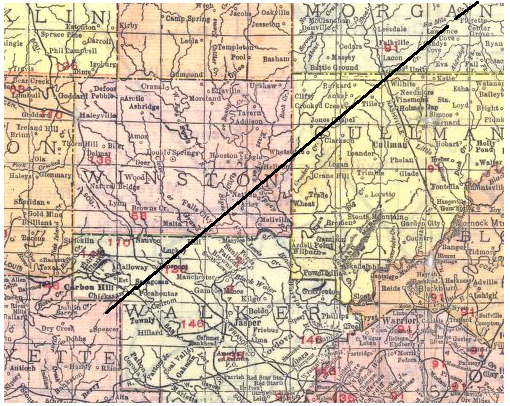 It is also possible that the paths shown in the map above may have been broken in more places than shown. 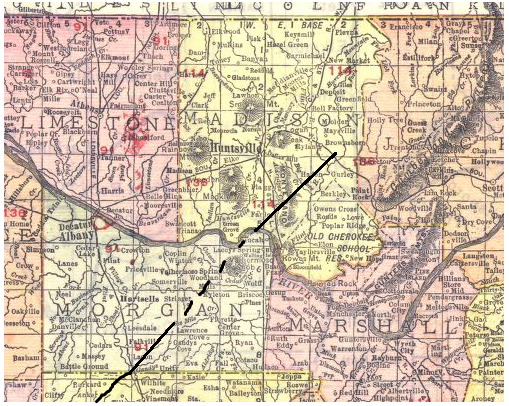 It does appear though that two tornadic supercells moved parallel to one another from southwest to northeast during the morning of April 20, 1920 in northwestern Alabama. These tornadoes were part of a larger outbreak that affected the states of Arkansas, Tennessee, Missouri, Mississippi, and South Carolina between April 19th and 21st. One of the tornadoes in Alabama was a continuation of a tornado path from Mississippi. 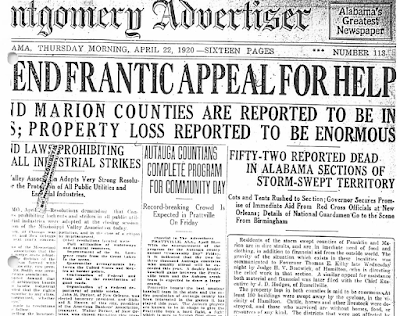 The first tornado left Mississippi and entered Marion County, Alabama around 9:30 a.m. In Marion County, 20 people were killed and at least 200 were injured. Nine were killed south of the Bexar community. 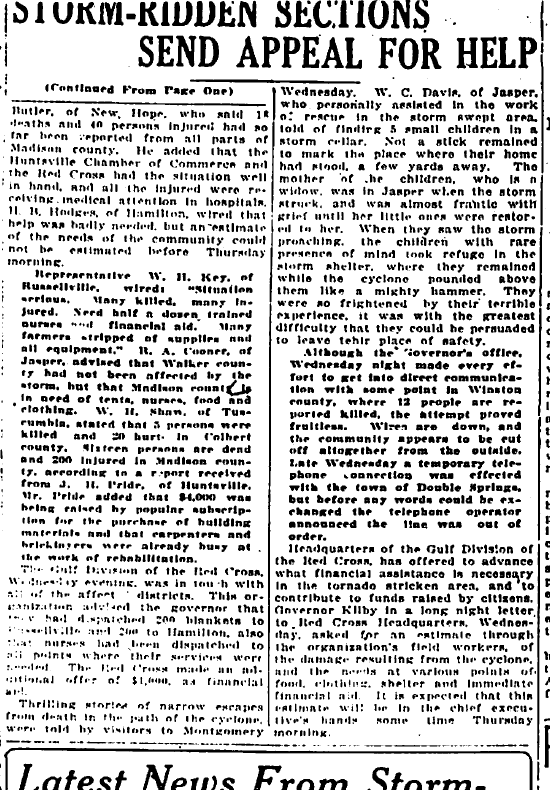 The tornado then entered Franklin County where the hardest hit community was Waco, which was "no more" at the time according to the Florence Times. 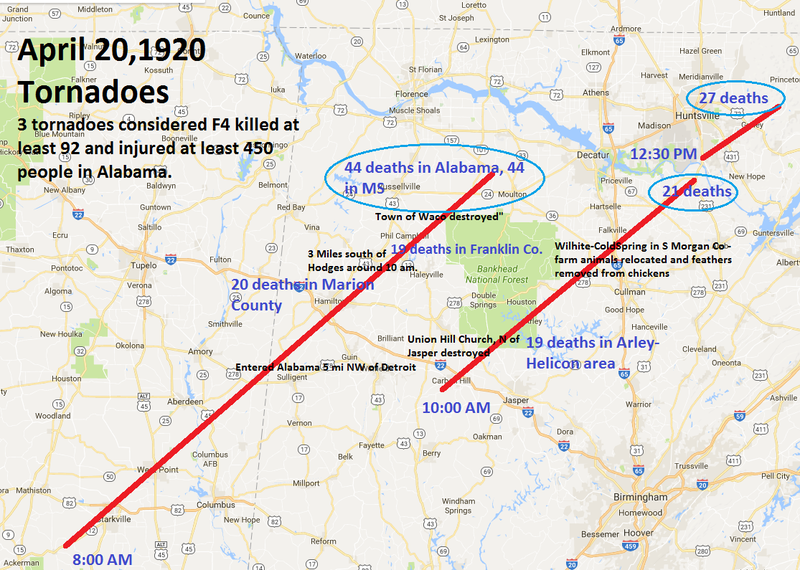 According to the April 29, 1920 Tuscaloosa News, Alabama Governor Thomas Kilby's office listed 19 as dead and 92 injured in Franklin County. 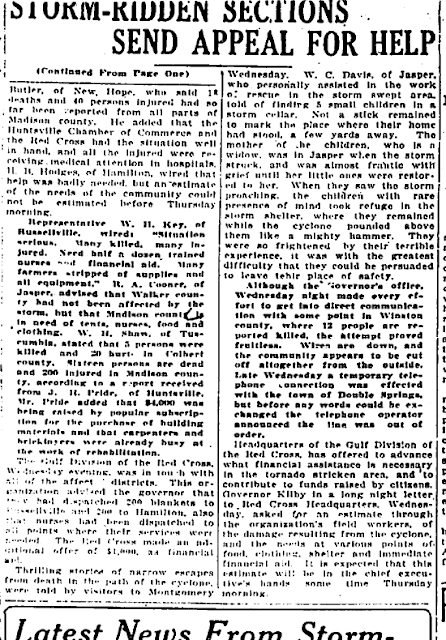 All nineteen deaths in Franklin were reported near the Waco Quarry, with nine of them being in a single family. Leaving Franklin, the twister continued into southeast Colbert County in the Mehama community south of Leighton. Mehama was reportedly "wiped out" and four people were killed there. As the tornado moved into Lawrence County the intensity decreased, but one person died southeast of Town Creek. It is unclear whether the tornado may have continued at a lower intensity as it crossed the Tennessee River into Limestone County. "The dead and injured were brought into Hamilton and the courthouse has been converted into a temporary hospital. Men and women of Hamilton...have worked heroically all day and far into the night to give such relief as they could.....Most of the dead brought here were terribly mangled. Arms and legs in many cases had been blown completely off....dead cattle, horses, and mules are found everywhere." The second tornado developed in extreme northeast Fayette County and strengthened rapidly as it moved into Walker County. Hardest hit communities in Walker County included Saragossa, Pocahontas, and Fall City. The Union Hill Church 12 miles north of Jasper was destroyed. 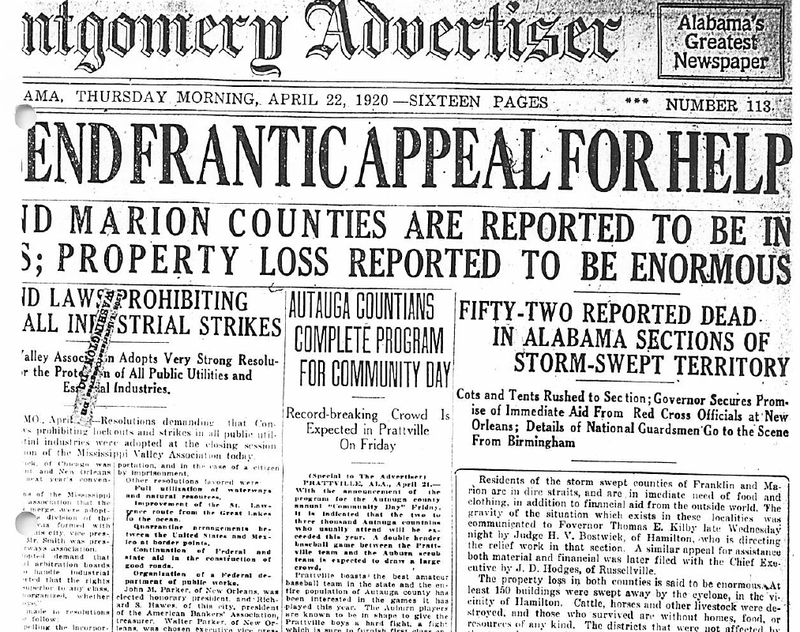 The tornado then entered Winston County, affecting the communities of Arley and Helicon, where at least 19 people were killed. Helicon was said to be "completely demolished". The tornado then moved through northwestern Cullman County into southern Morgan County near the Wilhite community around Noon. In all, at least 21 were killed in this tornado. This tornado seems to have ended over Morgan County as the storm moved toward Madison County. 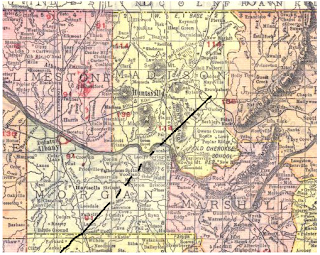 According to the April 1920 edition of the Monthly Weather Review, "near Wilhite in southern Morgan County the cloud was black with a yellowish tinge. Many farm animals were moved from one farm to another, feathers were blown off chickens, and a pump was pulled out of a well and broken into two parts." The same storm that produced tornado number two produced a tornado that touched down in the vicinity of the Tennessee River as the storm entered Madison County. The death toll in Madison County was at least 27 and over 100 were injured. Hardest hit communities included Green Cove, Lily Flag, Southeast Huntsville, and the Brownsboro-Gurley area. According to Huntsville Postmaster R.L. Okal, "I met a Mr. L.W. Baily... who said the great, black, whirling cloud...was small at the bottom and great at the top; that as it approached nearer all other clouds in the sky appeared to dash toward it and were swallowed up." In researching this post I came across a blog post with photographs from 1920 from a descendant of tornado survivors from Marion County. You can view that blog post here.